In 2017, Pittsburgh celebrated the 100th Anniversary of our historic seat of government, the City-County Building! Explore this website to learn about its dynamic history and find out how to visit our historic home! Whether you are visiting the Mayor, speaking to Council, getting your marriage license, or just love architecture, we want you to join our century of memories! Use the hashtag #PghCCB to share your photos!  In 1911, a City of Pittsburgh Commission was formed by unanimous resolution of Council for the construction of a new City Hall. The Commission, which by 1913 had been joined by the appropriate members representing Allegheny County, employed New York architect Cass Gilbert to arrange a competition for the design of a new municipal building. Of the 16 entries, the winning design was submitted by the firm Palmer, Hornbostel, & Jones of New York, who were represented locally by Edward B. Lee. The plans were officially adopted on January 19, 1914, and began the following year. The building acted as a gift to Pittsburgh to honor the 1916 Centennial of Pittsburgh's 1816 incorporation as a City. 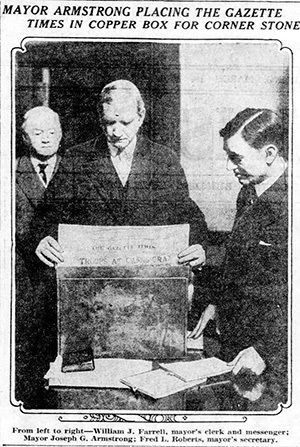 At the March 1916 dedication ceremony, Mayor Joseph Armstrong placed a time capsule into the still under construction building. Two and a half years later in December 1917, he would become the first Mayor to call the City-County Building a second home. The missing time capsule has yet to be discovered. 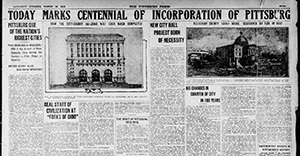 The Pittsburgh Post-Gazette announces Pittsburgh's 1916 Centennial and the construction of a new City Hall. Mayor Armstrong places a newspaper in the time capsule to be buried in the City-County Building. 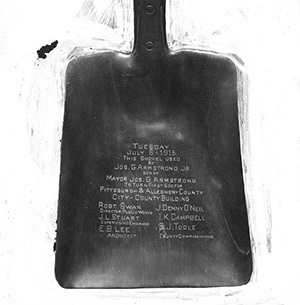 The shovel used in the groundbreaking ceremony of the City-County Building. 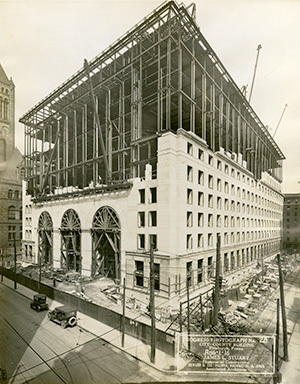 The City-County Building under construction in 1916. This is the home of your government, please visit us to learn more about how Pittsburgh's government serves its people! Please provide the following information, we'll be in touch with you shortly.